Grate the almond paste with the large holes of a box grater. Mix the sugars and cornstarch together in a large bowl. Add the grated almond paste to the sugar mixture. Mix until fine granules form (you can also do this in a mixer on low). Beat the egg whites in a separate bowl with a fork until frothy, 1-2 minutes. Add the egg whites and salt to the sugar/almond paste mixture and mix to combine. Roll the dough into teaspoon-size balls and roll in the slivered/sliced almonds to coat. The dough will be very loose – keep your hands wet to make it easier to roll. Place the balls on wax or parchment paper and cover with additional paper. Let the dough balls sit out on the countertop for 1-3 hours, until they dry out a bit. Bake the cookies on parchment paper-lined cookie sheets for for 12-15 minutes, until puffed and light golden brown. Note: this recipe may be halved. In Recipes-list.com we have selected the most viewed recipes from category - uncategorized . Enjoy the best recipes specially selected for you! 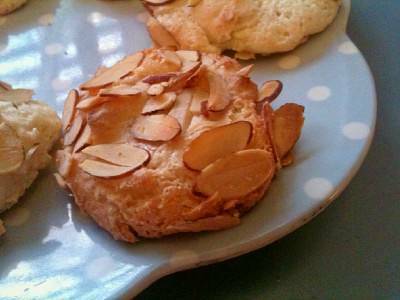 Almond Paste Cookies is the right choice that will satisfy all your claims.